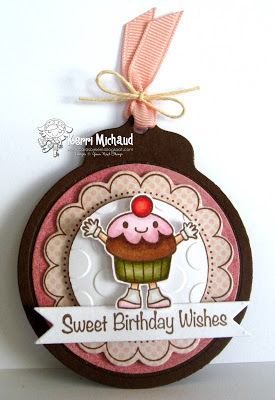 I used this adorable cupcake from the Your Next Stamp set Cute Foodies to make a fun little birthday tag! The sentiment also comes with the Cute Foodies set, and I stamped it onto a banner that I cut with the YNS Fishtail Banner Dies. The scalloped circle was stamped with the Flower Fun Scallop Cling Stamp onto some My Mind's Eye Lost & Found Madison Avenue dp and cut out with the Flower Fun Scallop Die. I stamped the image once again on white cs and cut out the center circle which I then embossed with the CB Seeing Spots embossing folder. The cute cupcake was popped up with foam tape, and the whole thing was adhered to a tag that I cut with the PTI Tag Sale #4 Die. OMGosh, that cupcake is too cute! Darling tag, Kerri! 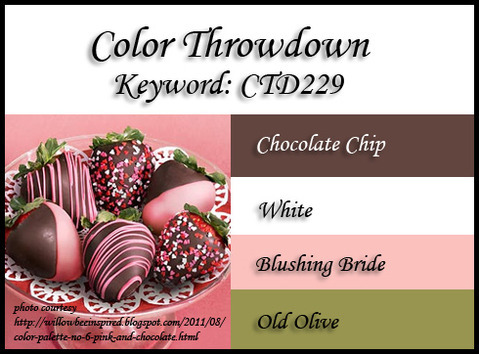 What a yummy color combo, and I love your sweet little tag! Oh my gosh, how adorable! Love the round shape and your coloring. I need to go check out that cute foodies set! Too cute! The tag frames your cupcake image perfectly. This tag is just too cute! Yep, those chocolate-covered berries were SOOO tempting and I almost bought some at Krogers today but opted for fresh strawberries instead! Didn't want to blow my slow but sure progress at losing weight! OMG!!! How cute is that precious little cupcake...this is such an adorable birthday tag, Kerri!!! Adorable tag, very fun and cheerful. This is too stinkin' cute! For a tag, this really makes an impact with all of your layers, details and adorable image! Love it!